So today we're all settled in our temporary home at Century City - kindly sponsored by our super-dooper estate agent, Jeanne-Pierre from Milieu Properties. In days to come we'll bring you photos from in and around the area, but today it's Theme Day. Today's photo was taken in the city centre, on Darling Street just up the road from the Castle. 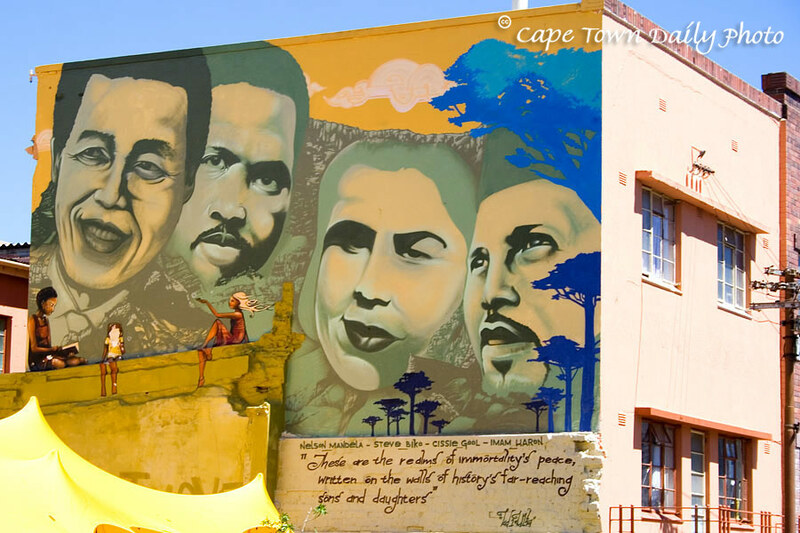 The mural is of Nelson Mandela, Steve Biko, Cissie Gool and Imam Haron. Take a look at our CTDP Extras Blog for more graffiti and street art around Cape Town. Please use the links below to visit a few of the 144 City Daily Photo blogs taking part in today's Theme Day. Posted in General on Saturday, 1 March, 2008 by Paul.